The interest rates had come down drastically in last few years and most senior citizens depend on fixed deposits for their regular income. The tax exemption of Rs 50,000 interest income from Post office or Banks under section 80TTB is good move to compensate for the same. However if you take benefit u/s 80TTB then you cannot claim tax benefit on interest received on savings bank account u/s 80TTA. This will lead to saving of Rs 2,600 for 5% tax slab, Rs 10,400 for 20% tax slab and Rs 15,600 for 30% tax slab. Budget 2018 has introduced standard deduction of Rs 40,000 for both salaried and pensioners. For salaried this is not much beneficial as medical reimbursement and transport allowance have been abolished. But as pensioners did not have these allowances, Rs 40,000 is straight deduction for them! The deduction for medical treatment of specified critical illnesses have been increased to Rs 1 Lakh. Earlier the limit was Rs 60,000 for senior citizens and Rs 80,000 for very senior citizens. There is TDS (tax deduction at source) for almost all kind of income. 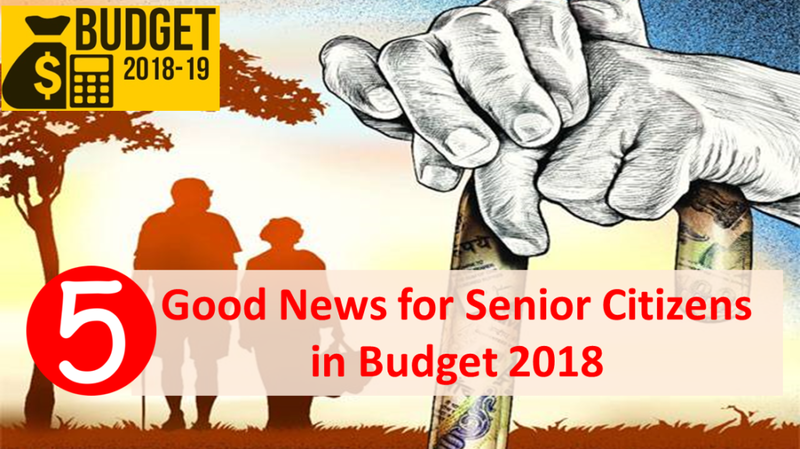 However as a relief to senior citizens Budget 2018 has raised the limit for TDS from Rs 10,000 to Rs 50,000. So TDS would only be applicable for senior citizens if the annual interest income from a bank/post office is more than Rs 50,000. Pradhan Mantri Vaya Vandhana Yojana is a government backed pension scheme for senior citizens offering 8% returns. This scheme has now been extended till March 2020. Also the investment limit has been doubled from Rs 7.5 lakhs to Rs 15 lakhs. This is good scheme for senior citizens in lower tax bracket. But remember Senior Citizen Savings Scheme still offers higher interest rate but with shorter lock-in. Overall this is a good Budget from Senior Citizens perspective and has provided much needed relief. yes under which section of Income tax exemptions. I am paying an amount of Rs. 5000 /month in HDFC Bank for 5 years plan.My age is 70 years. Kindly let me know whether the principle amount is eligible for tax exemption ( for one year Rs. 5000×12 = 60000 ). Under which section of income tax rules. incometax exemption for sr citizen’s fo0r medical insurance? Then how is this a benefit to sr citizens ? There are Insurance companies like Star Insurance which offer health insurance especially tailored for senior citizens. whether a senior citizen can invest both inPMVVY & SCSS i.e rs3000000/-(1500000/- in each) from 1st april 2018. No doubt FM has given lot to Sr citizens but what benefits Govt gives to taxpayers who give more than one third of their hard earned salary as Income tax? Well that question should be asked to politicians when they come to ask for vote!